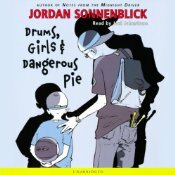 Drums, Girls, and Dangerous Pie by Jordan Sonnenbllick, read by Joel Johnstone. (Grades 4-8.) Scholastic 2004, Scholastic Audiobooks 2006. 4 hours, 30 minutes. Review copy provided by my local library. I love books that make me laugh and make me cry. Drums, Girls, and Dangerous Pie certainly fits the bill. It also gets a prize for being a book about cancer that is not depressing. It ALSO gets a prize for being the book that kept me entertained during my hours-long wait at the DMV when I got my Illinois license plates in 2007. Steven is your average eighth-grade boy. He has a crush on the beautiful cheerleader Renee Albert, he plays drums in the jazz band, he doesn't particularly care for math, he avoids his annoying five-year-old brother Jeffrey whenever possible... But everything changes for Steven when Jeffrey gets a nosebleed that won't stop. And it turns out that Jeffrey has leukemia. Suddenly, Steven's parents are constantly fussing over Jeffrey, taking him to Philadelphia for treatment, and Steven's even banished from his own home when he gets the stomach flu. It's enough to bum anyone out, but on top of it all is the possibility that Jeffrey could die. If you haven't read any of Jordan Sonnenblick's books, I implore you to start. Start with this one. This is a great funny book about a serious subject. Believable characters bring middle school to life. Reading this book (and "rereading" it by listening to the audiobook) instantly brought me back to the middle school band room. Hand this one to tween boys looking for something funny and realistic. Hand this one to tween girls looking for more of those tearjerker books. (Or boys looking for tearjerkers or girls looking for something funny.) Not only is this an awesome book, but it's a crowd-pleaser, as evidenced by its Rebecca Caudill (kids' choice) Award (2008). Joel Johnstone does a nice job with the narration, giving characters voices that fit them and delivering the humor nicely. I especially like his raspy five-year-old voice for Jeffrey (I find many actors' "little kid voices" annoying, but not this one). Music introduces the book and plays at the end, which sets a nice tone for a book about a kid in All-City Jazz Band. I was laughing along and tearing up at all the right places. If you like Drums, Girls, and Dangerous Pie, be sure to check out the sequel, After Ever After, a story told from Jeffrey's point of view. Both books are on shelves now! Hey, I'm an Audible Affiliate, which means that if you purchase items after clicking links on my blog, I may get a commission!